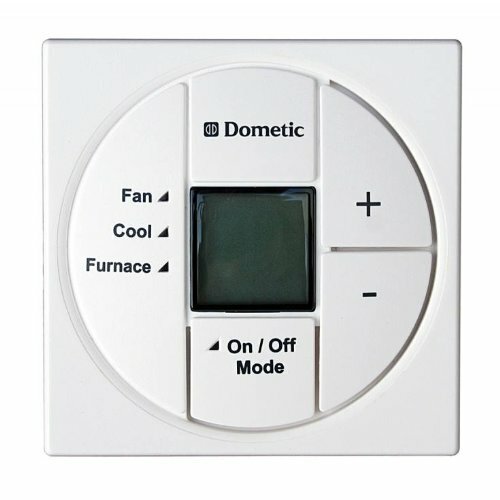 I'm specifically interested in THIS thermostat rather than the various ones from Home Depot etc that require modification for fan speed control. According to the info I can find it's a direct replacement for the Analog T-Stat used for a Suburban Furnace and Mach A/C unit. I'm tired of my analog T-Stat because it doesn't show the actual temp. Also it does a poor job of regulating temp for either heat OR A/C. When on heat my feet start to feel extremely cold before the furnace kicks on and when my eyeballs start to roast it finally shuts off. Pretty much the same drill with the A/C only in reverse. From what I've read online the digital unit pictured does a far better job of eliminating these extremes. Again, not interested in the Honeywell's, Hunters, etc that others have used, Just this one I don't have to modify. Yup, that will work. I was going to replace with that exact unit for the exact same reasons you did. I ended up with a single speed stick n brick model because I had an extra new one in the garage already. The analog one you have may have the wires soldered directly onto it, when you remove leave a few inches and you'll still net a few bucks selling that crappy thing on eBay. I think I got $23. Yes did exactly this one wire for wire swap. Digital is way better. Analog had a +/-4 degree swing so set to 70 would go down to 66 or up to 74. Digital is either 1 or 2 degrees and it works when you are not level . I got it from Amazon for about $35 but it seems prices went up. Careful removing the old one as the hole was large for mine and wall material was thin. I pulled wiring until I got to splices done by factory and cut there. Stuffed the wall with some insulation to prevent air from coming in and then used the commands strips with velcro to reattach to wall as the holes were torn up from factory. Yep. I bring it up every time the question arises or someone asks what mods they should consider. Took me about 5 minutes and it is a great mod. All the wires are 1:1 match and there's no guesswork. No backlight, but that's OK. There is, of course, a black version of this if it fits the decor better. I replaced my garbage analog stat with an Airexcel digital unit (P/N 9430-3382), which is the same as Coleman Mach company-wise. It works like a champ and was very easy to install. It was a simple matter of clipping and stripping back a bit of the old wires and plugging them in the new thermostat color for color, no splicing required. The only disadvantage is that the old mounting holes are exposed. I plan to cut some small plugs of wallpaper from behind a cabinet to cover those. It has a backlight when a button is pushed, not all of them to that. Performance wise it never misses a beat, keeping the temperature with in a degree or two heating or cooling. I've also swapped the analog to the digital Coleman. Easy change. Only complaint, the screw holes on the two units are different. While I had the unit off, I glued a couple of pieces of wood the back side of the "paneling". Gave more purchase for the screw. I have a Suburban Furnace & a Dometic AC unit. 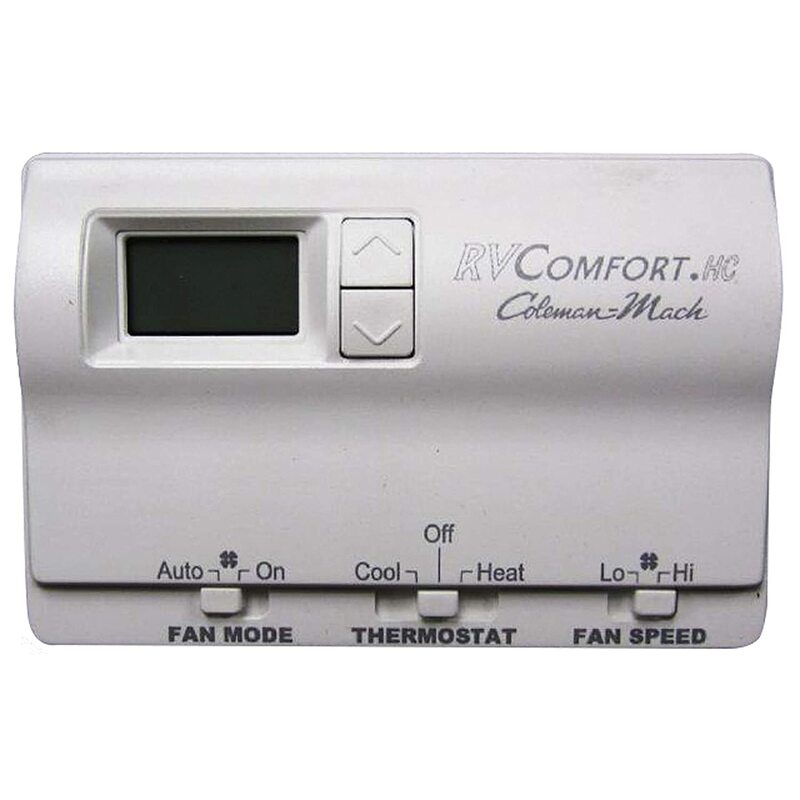 Can I use this RV Comfort Thermostat? I don’t think so. Your t-stat is a 3 wire and the Coleman is a 5. Since your unit is a 2010 model, I don't believe it has one of the digital communication t-stats, so you can use a residential t-stat to replace it. The problem with using the Coleman is that coleman uses positive switching and Dometic uses negative switching. Probably not a bad idea to take a picture of your existing T-stat 'wired up'. I think I used the SPP6 known to knock off 5 amps of starting load. This one not expensive ~ $35 some are much more. Did not take long to do. With the delay set ~ 4 sec its much smoother. It is not a 'must have' but glad I did it.